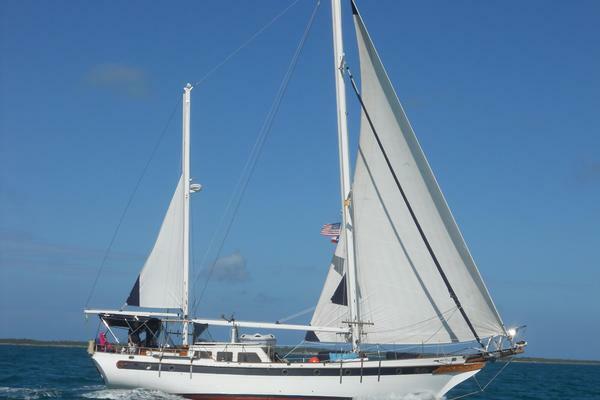 FREYA - has had a huge refit over the past several years to include boom furling system with electric winch, new sails, hull and deck paint, complete re-wire job, new plumbing and faucets, new instruments, complete bottom job, electric head, water heater and more. This boat leaves very little to be done - She is excellent! FREYA was purchased by her current owner in 2007 and since then he has done a lot of upgrades to bring her up to her current great condition. This keel + centerboard sailboat was built for ocean cruising but the alternate shallow draft allows her to be comfortable almost anywhere. She can sleep six in a varnished Mahogany layout plan that includes an Owner's Cabin forward, Head, and a Main Cabin that has a full-width Main Salon and aft Galley/Nav station area. 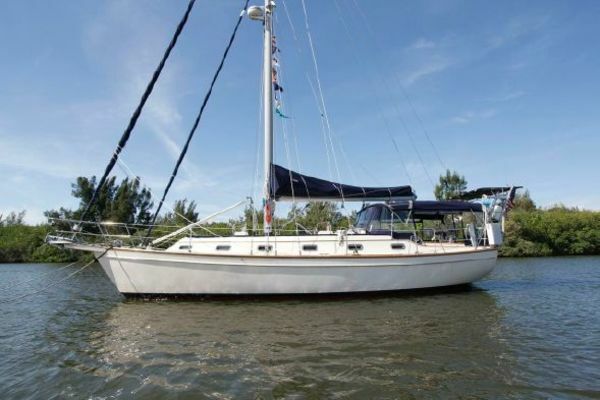 FREYA is a shared listing with Elliott Bay Yacht Sales. Construction: Solid fiberglass hull reinforced with additional laminations in all stress areas. Deck is set in a 6" flange molded into the hull, fiberglassed and bolted to form a permanent hull/deck joint. Nonskid pattern is molded into the deck. Keel with centerboard underbody = Draft: 4’6" board up, 8’7” board down. External lead keel is fastened with stainless steel bolts, and the bronze centerboard is operated by a worm gear with grounding override. Varnished aft deck teak-covered double lazarette and separate propane locker. FREYA's 2011/2012 winter haul and service included a complete strip and peel of the hull, rebuild with vinylester resin, fairing, epoxy barrier coat, all new through hulls, and new transducers. This was followed by a trip to Native Brightworks for fresh varnish. Cockpit has a varnished teak cockpit coaming with built-in winch pockets. Forward Owner's Stateroom with V-berths with storage and tankage below. Hanging locker aft to starboard, bureau, bookshelves and overhead opening hatch. Moving aft to port is the Head with stainless steel bowl sink in countertop and a vacuflush toilet plumbed to a holding tank. Hanging locker and storage locker. Main cabin features Salon amidships with a drop-leaf dining table center-line. Settees are forward port and starboard, each of which slides out to make a transom berth with drawers under. Each settee has a pilot berth outboard and over. The Galley has a sink and stove is aft to port with refrigerator compartment and locker stowage opposite to starboard. Inboard companionway steps are removable for engine access and lead up and aft to the cockpit. Nav Station is incorporated into the starboard Galley area, with chart storage above. FREYA's sailing gear was upgraded with Schaefer in-boom furling, Harken mid-boom traveler, Harken power winch, North sails, and lines lead aft with all new blocks and running rigging. The major electrical upgrade included completely rewiring the boat: new electrial panels, new charger, new alternator, new regulator, and updated batteries.